Is your cat still scratching furniture or scratching carpet even if you have a scratching post? You are not alone! The following information will help with choosing the best scratching posts for your pet that they will use and love. Cats have individual preferences for textures. Most often, texture is discussed when it comes to a cat’s favorite type of food, litter or the lining of their bedding. The texture a cat prefers to scratch on is often overlooked. If a particular surface or material they are offered to scratch does not feel good to a cat, she will avoid touching it. Popular cat scratchers come in materials such as corrugated cardboard, sisal rope, sisal fabric, berber and other low pile carpeting, wicker, jute and natural wood. It is unfortunately not always easy and certainly not cheap to try and fail at getting just the right scratcher, but there are additional tips we have to share that will hopefully help curb the cost of losses. The orientation of the scratcher is important. The orientation of the scratcher the cat is presented with may affect their liking of it. Pet owners with multiple cats may tell you they have one who prefers vertical posts while another prefers one with an incline. Scratchers come in a variety of orientations including curved, hourglass shaped and elongated chaise/lounge and bed styles to name a few. Generally the three orientations a cat may show a preference for would be horizontal, vertical or inclined. The cost of pet accessories can add up quickly. Scratching post costs range in cost from anywhere between $20.00 and into the hundreds! It can be scary to think of spending $75.00 on a scratching post the cat may ignore. When we know many have had success with the posts that are lower in cost, are the higher priced scratching posts worth it? At the lower end, the corrugated cardboard scratchers can be replaced for as little as $10.00 per month. Over the course of a year, the expense for refills may end up being the same $75.00 that a higher end scratcher would initially cost, only the higher end scratcher would not need to be replaced for years because of the surface materials used to construct it. If you have an idea that your pet may enjoy the surface material of a higher priced cat scratcher, the investment over the long term may be worth it to you. Cats generally prefer a textured woven sisal fabric over all other materials and is most often a sure and winning bet. A significant benefit to the cost is that these posts are often designed to accent the home as a piece of décor, are well constructed and add aesthetic value for their price and function. Cats do not always want to share their things. Even the friendliest of cats may get territorial about their scratching post. Likewise, a cat with a passive or more accommodating personality may not want to intrude on using a surface to scratch on that another cat uses to scratch. One of the reasons cats scratch is to scent-mark their territory. Glands in their paws release a pheromone with their unique scent. They use this form of marking to label a personal item as belonging to them. In a multi-cat household one cat may be ignoring a particular scratching post simply because it is marked with another cats’ scent and their instinct tells them to leave the item alone. The home needs multiple scratching posts. Having scratchers available especially close to where cats nap and play can help to prevent scratching on carpet and furniture. Cats stretch shortly after waking and have tendencies to scratch before they begin to play. Many cat trees double as cat scratchers but a single cat tree as their scratching post is not enough. Several posts for them scratch on throughout the home, not confined to only one specific area reduces the chances they will use the furniture. A cat may not immediately understand what to do with scratcher you have brought to them. If their instinct does not draw them to scratch it right away, they may need to be introduced to what they are supposed to do. Rubbing dried catnip or catnip spray onto the scratching material may entice them to begin scratching. Another technique to try is placing their paws on the scratching surface and using praise, affection and optionally, treats in exchange for touching it. Even if they never have to be trained to use it at all, giving praise is a great way to let a cat know that they are encouraged to touch their scratching post. If a cat still does not use the scratcher after several days of encouragement and rewards with treats, you can note the material and orientation of the scratcher as possible things to not try again when choosing a scratching post. Their needs may change as they age. Older cats are not nearly as agile or flexible as their younger counterparts. They may need special accommodations to condition their claws and do their stretching. A cat once interested in a vertical scratcher may begin to prefer to use a scratcher with an incline or one that is completely horizontal. Some may have a change in their preference for material. Textile fabrics hold claws tightly, allowing cats to really pull and work their muscles and joints to warm them up. This may be too much for an arthritic cat to deal with. 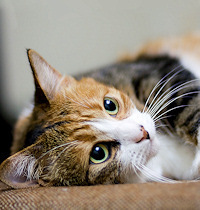 Older cats may take a liking to corrugated cardboard or natural wood surfaces. This allows them to still mark territory, condition their claws and work their joints and muscles more gently. Buy from a place where your purchase is risk-free. Pet stores and suppliers know that cats can be hard to please. Many of them offer a no-questions-asked exchange or return when presented with an original receipt within a limited time from the date of purchase. As long as the product is in a reasonable condition for them to take back, you can feel more at ease with trying out different options for getting the right scratcher for your cat with minimal loss. Before purchasing a scratching post, check the policy of the pet store to be sure you can take it back and try something else if your cat does not like it. Save your receipt in case it can be returned, and remember, you can also help your local shelter by donating new, unused items your cat didn’t like. The best scratching post for your feline is one that they like to touch and love to use. With patience and understanding, finding the right match for your cat will help keep their claws conditioned and their muscles limber and flexible. Proper scratching posts promote a healthy sense of security within their territory and can prepare them to warm up for a round of play and exercise.